With an oral examination and proper x-rays of the mouth, Dr. Kienle, Dr. Steinkeler and Dr. Gunawardena can evaluate the position of the wisdom teeth and predict if there are present or future potential problems. Studies have shown that early evaluation and treatment result in a superior outcome for the patient. Patients are generally first evaluated in the mid-teenage years by their dentist, orthodontist, or by an oral and maxillofacial surgeon If the wisdom teeth are impacted or causing other problems, the recommendation is often for surgical removal. All outpatient surgery is performed under appropriate anesthesia to maximize patient comfort. Drs. Kienle, Steinkeler and Gunawardena have the training, licenses, experience and board certification to provide various types of surgery and anesthesia to allow patients to select the best necessary procedures. These services are provided in an environment of optimum safety, utilizing modern monitoring equipment a surgical staff experienced in anesthesia techniques, and facilities that are accredited by Joint Commission. Non-infectious diseases may also arise in association with an impacted wisdom tooth. Cysts are fluid-filled cavities inside the jaw bone that develop as a result of impacted teeth and slowly expand destroying adjacent jaw bone and occasionally teeth. 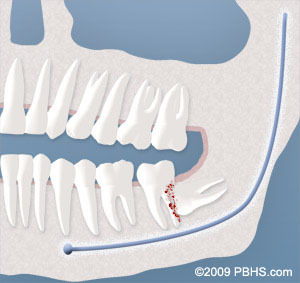 They can be difficult to treat if your wisdom teeth were not removed in your teenage years. Although rare, tumors can also be associated with the delayed removal or non-removal of wisdom teeth. Impacted wisdom teeth may contribute to the crowding of your teeth. This is most noticeable with the front teeth. This usually occurs with the lower front teeth and is most commonly seen after a patient has had orthodontia. There are a number of factors that cause teeth to crowd after braces or in early adulthood. Retained, impacted wisdom teeth may be a contributing factor due to the impacted tooth trying to erupt and pushing adjacent teeth out of position. Unless you have an active problem when you see the oral surgeon, the reason for removal of wisdom teeth is primarily to prevent long-term damage to your teeth, gums and jaw bone. If there is inadequate room to clean around the wisdom tooth or the wisdom tooth is growing into the tooth directly in front of it, the second molar, this can result in gum disease, bone loss around the tooth, resorption and/or decay. As wisdom teeth develop, the roots become longer and the jaw bone becomes more dense.When impacted wisdom teeth are removed in your thirties, forties or beyond, the post-operative course can be prolonged and there is a higher complication rate. Treating these complications is often more difficult and less predictable than with a younger patient. Healing may be slower and the chance of infection can be increased. In general, you will heal faster, more predictably and have fewer complications if treated in your teens or early twenties. 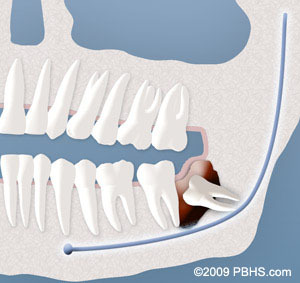 Most people prefer to be asleep when they have their wisdom teeth removed and usually decide to be sedated. You will be provided with appropriate anesthesia options at your consultation. All outpatient surgery is performed under appropriate anesthesia to maximize your comfort. Our office staff has the training, licensing, and experience to provide the various types of anesthesia including general anesthesia and sedation. These services are provided in an environment of optimum safety, utilizing modern monitoring equipment a surgical staff experienced in anesthesia techniques, and facilities that are accredited by Joint Commission. Drs. Kienle, Steinkeler and Gunawardena are board certified in oral and maxillofacial surgery and anesthesia. All of the doctors and surgical staff are also certified in basic cardiac life support (BCLS), advanced cardiac life support (ACLS), and pediatric advanced life support (PALS). On the day of your procedure, you will usually take a pre-operative antibiotic to help minimize post-operative infections. We ask that a parent or responsible adult accompany you to the facility and plan to stay with you the rest of the day. The procedure will take about 30 to 60 minutes and you will probably be in the office for 90 minutes. Recent advances in medicine and technology allow patients to undergo wisdom tooth removal in a manner, which promotes rapid healing and minimal post-operative discomfort. State of the art sterilization and infection control techniques are used at all times. Our facilities are fully accredited by the Joint Commission as ambulatory surgery centers. On the morning or afternoon prior to your surgery, it is essential that you have nothing to eat or drink (excluding prescription medications with a sip of water) for at least 8 hours. Your procedure will be rescheduled if you have not heeded these guidelines. We will usually provide you with prescriptions for pain medication and antibiotics at your consultation appointment, which for your convenience, can be filled in advance. When you are seated in the surgical room, we will make every effort to make you as comfortable as possible. If you are going to be sedated, we usually do this by placing an IV. This is a quick and nearly painless procedure that ensures optimal delivery of your medication. Local anesthesia is given to you once you are asleep to ensure comfort, and allow adequate time to travel home and rest. You will be sleepy for a significant portion of the day. Be sure to have an adult with you at the time of surgery and anesthesia. Make plans to have a parent or responsible adult stay with you for the rest of the day, following wisdom tooth removal. We do not recommend using dairy products such as yogurt, ice cream or milkshakes on the day of surgery, as nausea and vomiting may develop in conjunction with the anesthetic and pain medication. If you are given antibiotics and you take birth control pills, please be aware that the birth control pills might become ineffective so take appropriate precautions. The fee for your treatment is determined by a number of factors. These may include the difficulty involved in removing your teeth and which type of anesthesia is best for you. During your consultation appointment, the surgeon will need to review your x-rays, complete an examination and determine the best option for anesthesia, before an accurate estimate can be provided. Every insurance company has a different policy regarding the extent of coverage for a given surgical procedure. The our financial coordinators will help you obtain maximum insurance coverage for your treatment. At the time of your consultation, your specific situation will be discussed in greater detail. We encourage you to ask any questions you may have. If new questions arise after your consultation, please call our office at Warminster Office Phone Number 215-672-6560 to speak to one of our patient care coordinators.